So I’ve been a little absent on my blog for the last week. I have a really good excuse. I’ve been in Disney World for the last week. I had every intention of doing my usual blogging while I was gone, but HOLY COW, that place is a little overwhelming!! It was my first time to ever go, AND we surprised our kids that morning we left. It was such a fun week, but did I mention it was overwhelming? And I think we walked like 10 miles a day! And I’m 33 weeks pregnant. But boy did the kids have a great time! My 5 year old son was such a champ! He rode all the big rides with my husband while my girls and I hung out and saw many of the princesses. My mom and dad and two older nephews came along too. And the food…the food… the food! We had the dining plan and we had more food than we could possibly eat. 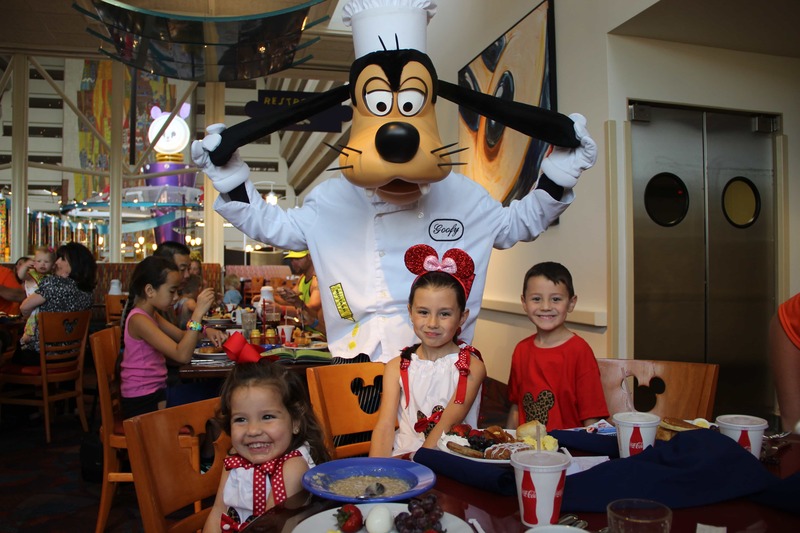 It was so much fun going to eat at the different resorts and special park restaurants. All the planning and researching was so worth it! Memories to last a life time!!! And speaking of memories, give this little pizza a try. It is such a nice change to a traditional Italian pizza. We loved it! My kids went on and on about how much they liked it. Gosh I love it when they just eat their food! It is really simple. I used Pioneer Woman’s Pizza Crust recipe, which I’ve blogged here. The garlic cream sauce makes it so good. Best of all, this pizza can be completely customized with all of your favorite veggies too. I kept mine pretty basic, but I see endless possibilities with this recipe. Line a small pan with parchment paper. Place bacon slices on parchment and cook for 10-15 minutes our until crispy. Season and grill chicken. Set aside to cool. In a skillet, melt butter and oil. Add garlic and shallot. Cook for 2 minutes. Add flour and cook for 1 to 2 minutes stirring frequently. Add wine (or beer or broth). Stir. Stir and cook for 2 more minutes over medium heat. Spread pizza dough onto pizza pan or stone. Prick with a fork all over. 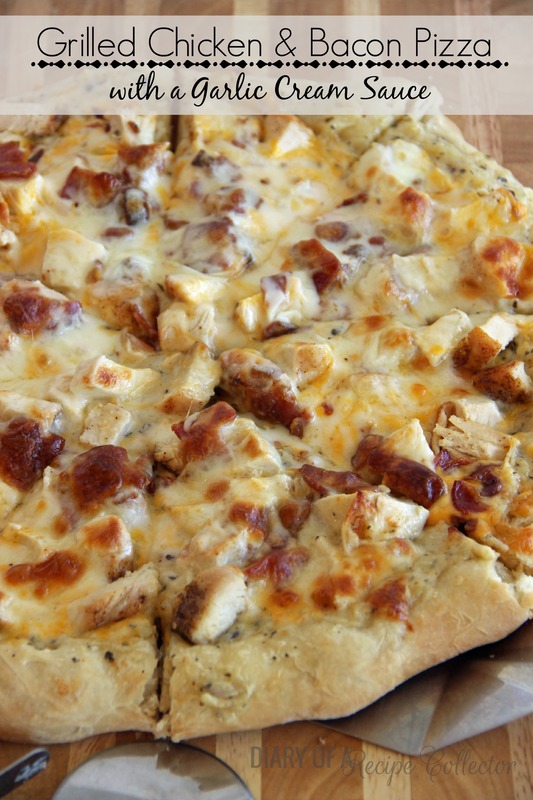 Top with chicken, bacon, shredded colby jack, and sliced mozzarella. This pizza is so versatile. Change it up by adding veggies like spinach or change up cheeses by adding shredded Parmesan or sliced provolone instead. Need some pizza making supplies? Do you love Disney like we do? 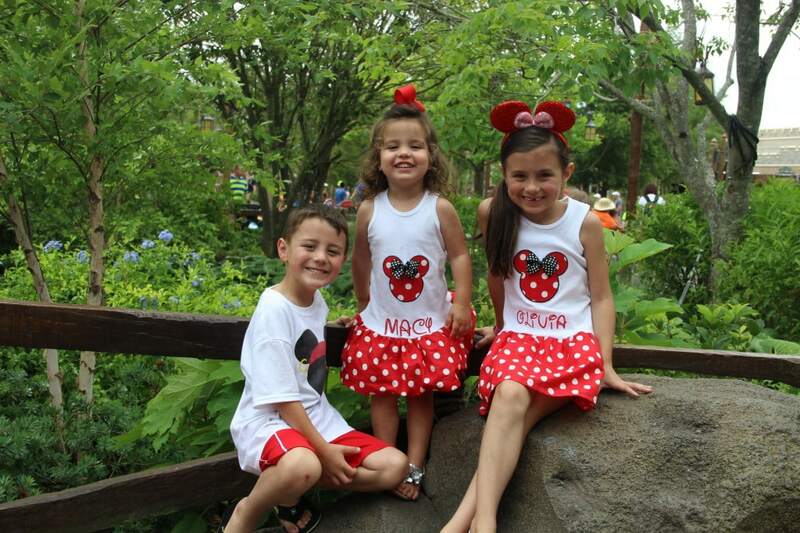 Planning a trip and need your Mickey or Minnie ears? 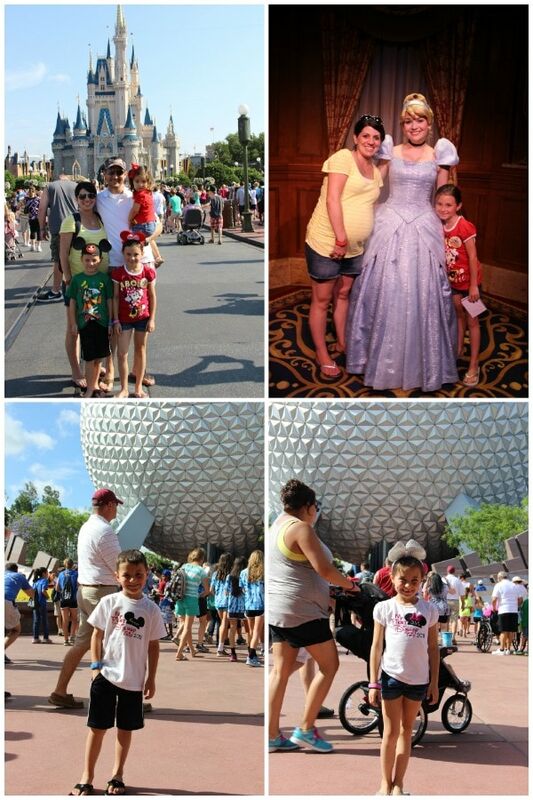 Hope you had a great time while in Disney World! Looks like you had a blast!! And this pizza sounds so delish!! Well Brenda, you didn’t get to see my ankles the day we left!! They were pretty bad! This looks AMAZING!!! I seriously had a jaw drop when I saw this yummy pizza. Following you on Pinterest and would love to link up with you on some blogging efforts! Mmm .. that pizza looks ridiculously good right now! Yum! I love pizza with cream sauce too. The pictures are adorable! 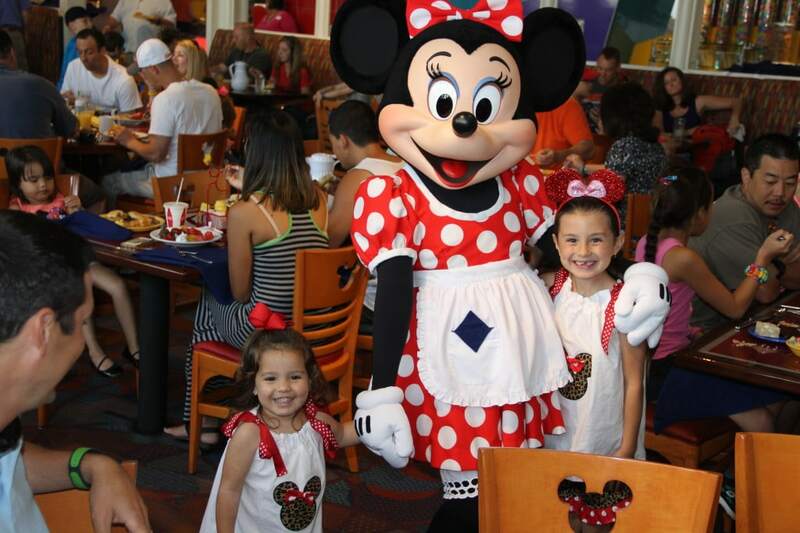 Reagan is going to flip when she gets to go to Disney. 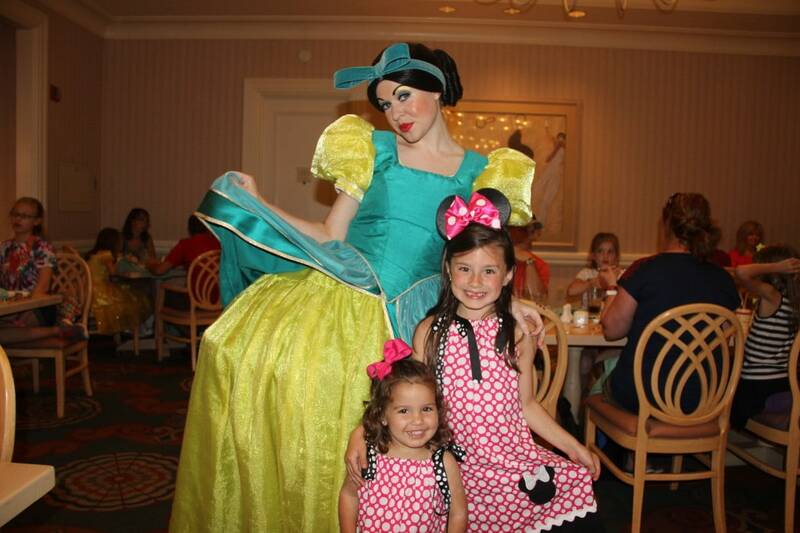 I’m not sure how she’s going to react to seeing all the princesses she loves so much! Have a wonderful weekend Jaren! 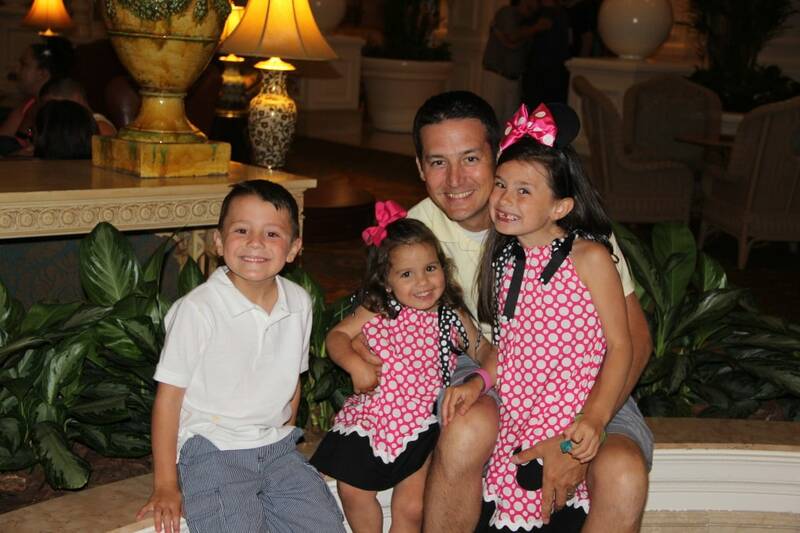 I LOVE Disney World and cannot wait to get back there! Wonderful pictures! They capture the magic! Speaking of magic, this pizza divine!! I love all the flavors! Thanks Tanya! It IS magical! This pizza looks so delicious, I can’t wait to try it!! Thank you so much for linking up at Tasty Tuesday! Your recipe has been pinned to the Tasty Tuesday Pinterest board! Please join us again this week! It looks like you guys had such a good time, and I love seeing these cute photos of you, Jaren! This pizza looks amazing BTW. Sharing! You pizza looks so yummy! And the creamy white sauce sounds incredible! 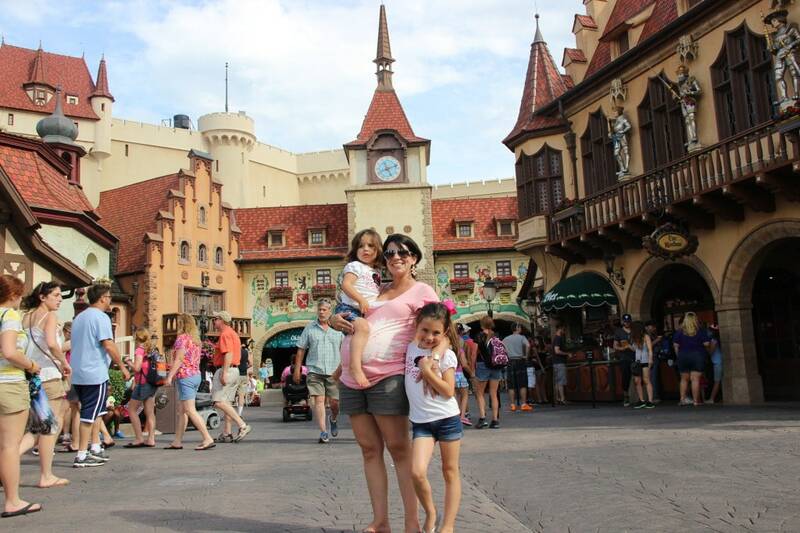 We are total Disneyland geeks and love to go there, but have never ventured to Disneyworld! Looks like we are going to have to give it a try. I’m also looking forward to trying this pizza recipe. Yummy! All nice recipes. Thank you. Have a great day and week! Can’t wait to try this pizza! It looks amazing! BTW, did you make all those cute disney outfits your kids were wearing? Absolutely adorable! Thanks Deanna! My mom made them after I pinned so many cute ones on Pinterest. 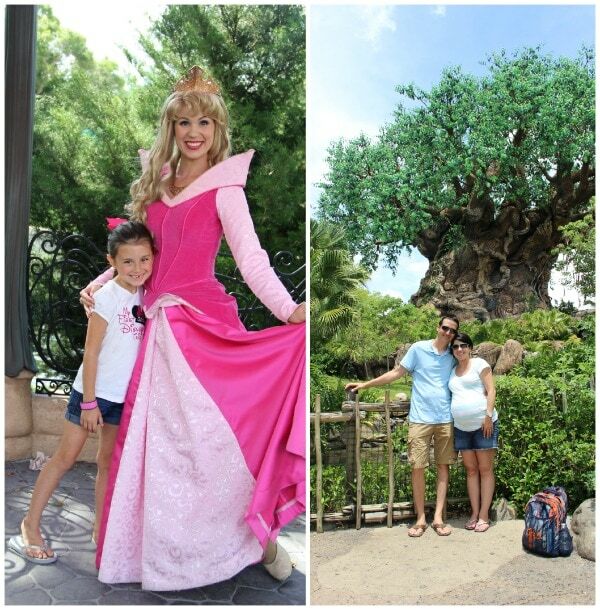 Disney World is amazing and doing it 33 weeks pregnant will earn you some serious stars. That pizza looks and sounds like something I really need to try. Just made this pizza for the family. Delicious! Easy to prepare and so much better than delivery! Thank you for the great recipe. Grace, I’m so glad you enjoyed it!! Thanks for letting me know!! 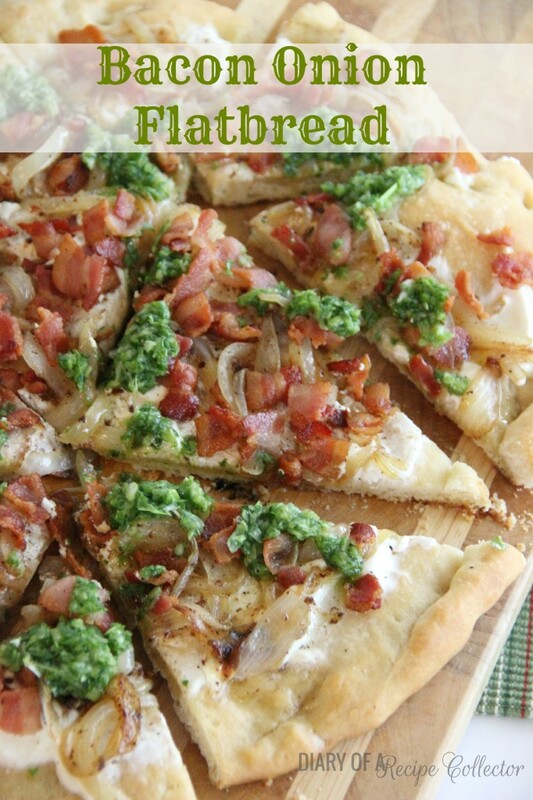 I plan on making this pizza next week…thanks for the recipe! Wonderful! Hope you love it! what a beautiful family. I will try this recipe in a few days and check back with the results. Thank you for sharing special events of your life. Great Lisa! Thanks for visiting! Oh my stars!! I just made this and it was AMAZING! I didn’t have the cheese you called for in the recipe, so I used shredded mozzarella and freshly grated Parmigiano Reggiano. This was melt in our mouths good! I also only had flat bread, cooked them at 350 degrees for 8minutes.Thank you, thank you!! Oh I’m so glad you liked it! It is definitely one of my favorite recipes on my blog! Thanks for letting me know, and your substitutions sound great too! That sounds awesome Julia! I will definitely try that next time. In fact, I was thinking of making it this week or next. Thanks for the idea! Hi Donna! We love this one! I’m a pepperoni fan myself, but this one is totally different, and I never miss the usual pepperoni when I eat this one. Hope you enjoyed it! OMG! My family just visited Disney World over the holidays, and we 100% met the SAME EXACT princesses! Like, it’s the same girls dressed up! So funny! Maybe they are real princesses 😉 Oh, and the pizza looks amazing! That’s so funny Laney! 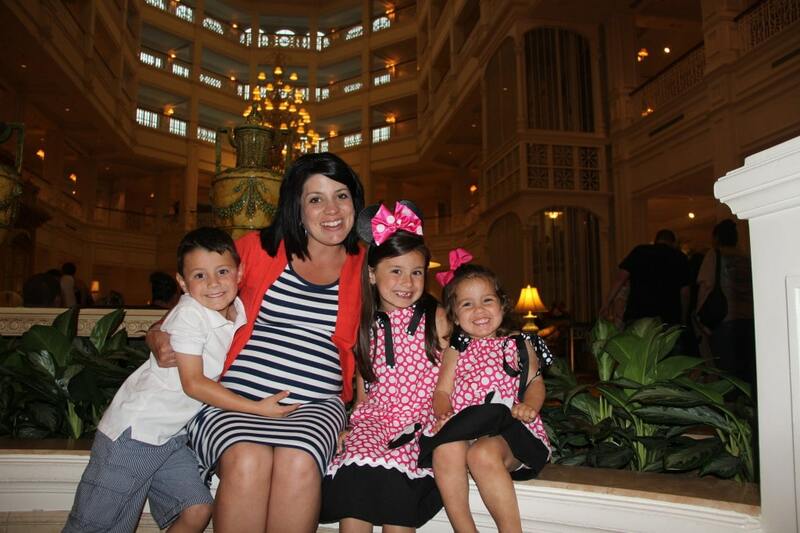 We had the best time on that trip, and I can’t wait to do it again…not pregnant! Can these ingredients be made ahead to make pizza when camping. Would love to try it just not sure how well it would work on open fire or grill. I do have to admit to being a little lazy when camping and the more I can do ahead of time the better. Sounds and looks delicious. Hi Kay! I totally understand wanting it to be easy while camping! Pizza on the grill is one of my favorites. I know making the chicken and the bacon ahead wouldn’t be a problem at all. I have not made the cream sauce ahead and refrigerated it before, but I would think it would be okay to make a day or two before and just heat it before putting it on the pizza. Thanks for visiting! No tomato sauce, this is interesting. I’m looking forward to trying this as an alternative to traditional pizza, especially when I don’t have any tomato sauce! Hi Carlene! It is a great change to the normal pizza routine! We love it! Thanks for visiting! This. Sauce. Is. It!!!!! Oh my word! Found this on Pinterest. I bought Naan bread. Made the sauce . Had deli chicken leftover from another dinner. Cooked up bacon, onion, garlic. So easy!! Next will be to try the pizza dough. Thank you so much for this recipe. It’s def a keeper. Just made this pizza. Absolutely delicious. I’m gluten sensitive so used Pamela’s gluten free pizza crust mix. It made 2 9” pizza crusts. I used corn starch instead of flour in the sauce. Otherwise made as written. Did I mention it’s delicious. Husband also loved it. The recipe was enough for both of the crusts. I parbaked both of them but plan to assemble one of them with the remaining recipe ingredientsand freeze it for later. I’m assuming it will be just as great. Thanks for the recipe. Thanks so much for sharing gluten-free options!!! This looks delicious. Can you prep the sauce ahead of time? Maybe in the morning and use that evening. Also, how easy/hard would this be to cook in a grill? Hi Amanda!! This makes a great make-ahead recipe! You can prep the sauce, cook the bacon and chicken, and just assemble it all when you are ready. We love grilling pizzas, and this one is a great one for that too. Just grill the dough on both sides before topping with sauce and other toppings. You can even assemble the entire pizza on a partially baked crust and freeze it for busy nights. Thanks for visiting!